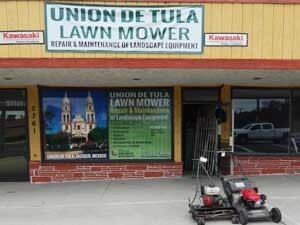 Serving Orange and Los Angeles Counties, since 2010, Union de Tula Lawnmower continues providing an outstanding service and best pricing in Service & Repair of Lawnmowers. We conduct Repairs and Maintenance Service to Commercial and Residential Landscape Equipments at its utmost performance. Our experienced technicians provide fast service for commercial Lawn Mower Chain Saw, Trimmers, Edgers, Blowers, Sharpening and Balancing of Mower Blades and any all Landscape motorized machines. 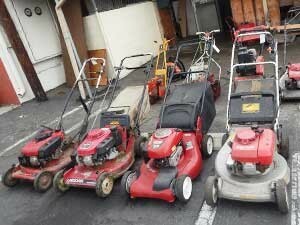 We have a wide Selection of Used Equipment for Sale. Feel free to stop by our showroom in La Habra, CA. The majority of our replacement service parts, such as Air Filters, Deck Parts, Belts, Blades and Clutches are 15% to 25% cheaper than big stores. Call us today and compare. For your convenience we also sell Fertilizer, Grass Seed, Oils and many, many Gardener Tools & Accessories. Bring your Landscape Equipment and We will Take Care of it.